At the Olympics, there’s no shortage of brands competing for the viewers’ attention. To stand out, we wanted to create a unique mobile experience that would connect the fans directly to Team USA, using AT&T’s own network in a way that had never been done before. We built a mobile app that would help carry the voice of the nation to our athletes overseas by letting Americans record and shout the iconic USA chant from back home. Their submissions were then directly integrated into our national TV spots, constantly refreshing a living, breathing wall of support. We then made sure the message was heard far and wide by expanding it online, through social channels, in Times Square, and all the way to the Olympic Village in Sochi. 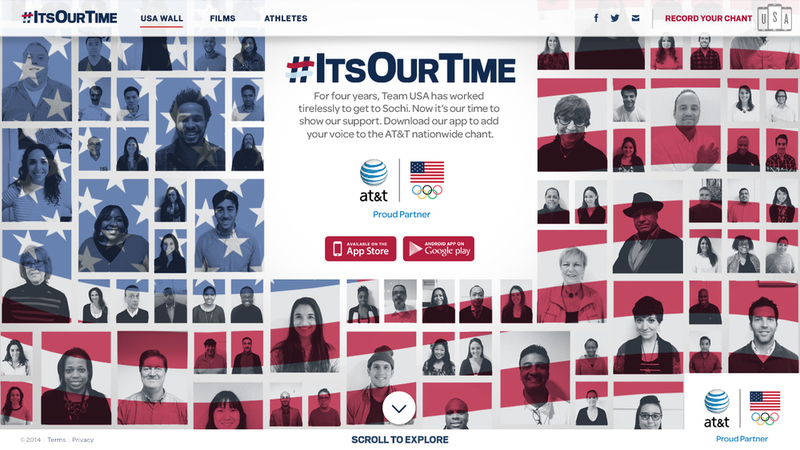 In the end, we created the first mobile app that allowed an audience to power a fully integrated campaign directly from their hands and allowed them to support Team USA, even though they were thousands of miles away.